We often make use of the Fulbourn 'Scout Hut in the Woods'. It has no public vehicle access, no electricity and only a standpipe for water. It provides a great base that is out in the woods, but with the backup of some shelter should an emergency or camping disaster befall us. When we meet or camp here, scouts, cubs and/or beavers need to get themselves to the parking area on Stonebridge Lane (ringed in blue on the map) at the allotted time, and can be collected from here again at the allotted finish time. 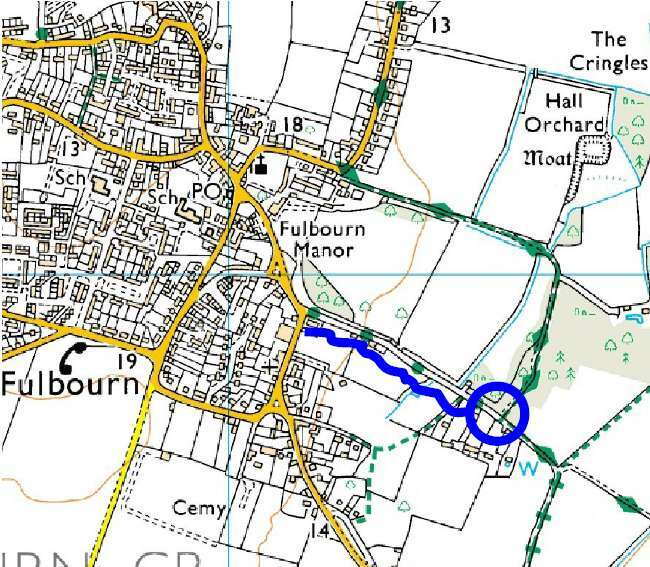 If you drive from Cambridge to Fulbourn on Cherry Hinton Road, you will go out past the Robin Hood pub and ARM at the Old Water Works where it changes name from Fulbourn Road to Cambridge Road, through the fields and over the hill with Fulbourn windmill on it. After entering the traffic-calming, this brings you to a double roundabout where Haggis Gap turns off, which you need to go straight over (on the map this is just above the phone symbol where it says Fulbourn), staying on Cambridge Road. Follow the road round the bends, first right at a grass triangle where it becomes Dogget Lane, then left, where, just after a third bend, you bear left down the side of a second central grass triangle (on the map this is the white triangle in the yellow roads halfway between the word 'Fulbourn' and the blue circle) onto Home End. About 200m on the right hand side is a small straight road with a high brick wall and trees along its left hand side called Stonebridge Lane. Follow that to the end where, opposite some houses, you should find a footpath off to the left and a parking area, ringed in blue on the map.